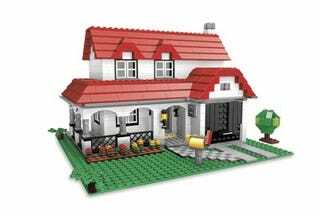 Jesus, we know you love Lego something fierce, but are you willing to live in a completely Lego house, like Top Gear star James May? May, known to many in the U.K. for his affinity of automobiles, speed being "Captain Slow," and other wheeled insanity, is prepped and ready to construct the two-story Lego house next weekend. More than 3 million bricks have been delivered to the building site so far. The building plans state that everything must be constructed with Lego bricks, if possible. This includes the planned working Lego toilet, Lego plumbing and maybe even parts of the power supply. May has put out a call for brick donations, should you be in the area next week with a big bag of Lego.